The team is reaching out to some other media outlets to build awareness outside of normal automotive channels (what I mean is not marketing in auto related websites or on portals.) They are planning some content within How Stuff Works and have already implemented a homepage wallpaper on Dictionary.com promoting the Prius. 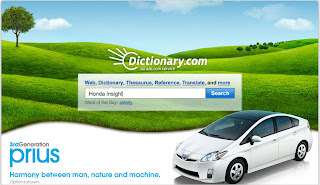 Let’s discuss the Prius Dictionary.com example. Right now it is simply a beautiful image of a Prius that covers the homepage. It’s a nice break from traditional banner advertisements. Unfortunately where it leaves off is in getting some good content integration in the Dictionary site. 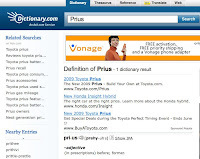 For example, type in “Prius” to get a definition and all you get is “–adjective (in prescriptions) before; former.” And the best part is the “sponsored results” above the definition provide links to the 2009 Prius and the all new Honda Insight.